It will soon be Course Selection Season for our Warrior Students! We like to kick this off by welcoming our incoming freshmen with an Open House! 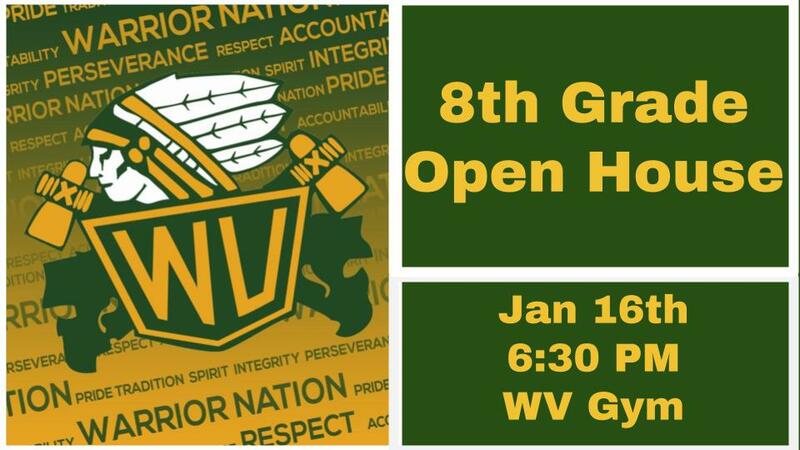 On Jan 16th, Waubonsie Valley High School will host our 8th Grade Open House event. This Open House is an opportunity for all current 8th graders (who will be entering WVHS next year as Freshman) to learn much more about the offered academics that they can take while a student here at Waubonsie. The Open House will begin in the Gymnasium at 6:30 PM where parents and students will meet building administration, hear about our new house structure, and learn about important steps with the Course Selection process. After the Gymnasium introduction, parents and students will then cycle through 4 important sessions that will give present 8th graders important information for a successful Freshmen year. Parents and students will then use this knowledge, along with the course guidebook, to plan out and select next year’s courses (course selection will take place via computer from home). Beginning Jan 16th until Jan 31st, students and parents will have the opportunity to register for elective courses for the 19-20 school year through their Home Access Account. Core course selection will be determined by the teacher and counselor for the student. We hope you take this opportunity to learn more about your future high school home. Let the excitement take root and the anticipation grow as we continue the long lasting Warrior Spirit, Pride, and TRADITION of the Warrior Community.